I have to say of all the years, 2009 has been my favorite so far. My sweet Frances was born on Christmas day 2008 and life hasn't been the same since. 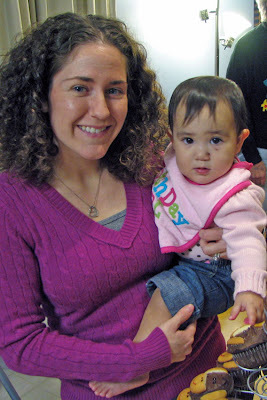 In 2009 I stayed up all night with a crying baby, changed diapers, learned what it's like to be a stay at home mom, then learned what's it like to be a full time working mom with a baby in daycare. I changed diapers and warmed up bottles and realized just how much you can love a little person that you just met. I can't imagine 2010 being better, but I am sure it will. 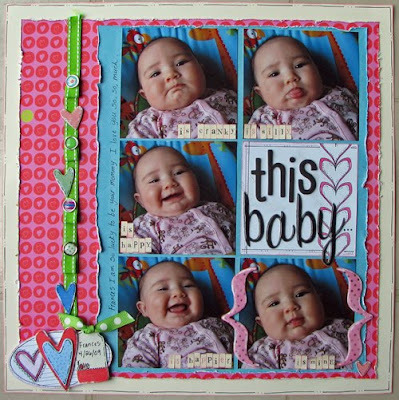 My friends at Crop Addict had the idea of posting a top ten list of our favorite layouts. I thought it was good idea to end 2009 so here is mine in no particular order. I will be giving away a RAK here on January 1st along with an announcement. I hope you stop by! Oh by the way mine won't be the only RAK you can win. Did that leave you in suspense? I hope so. Hehehe! Happy new year to you and your family, hope to see you back on the 1st day of 2010. I think this may just be my number one favorite LO. I just look at it and smile! My little girl Frances's feet when she was only a few minutes old. Boy a year sure goes by fast! I just like this one. I think it's cute! 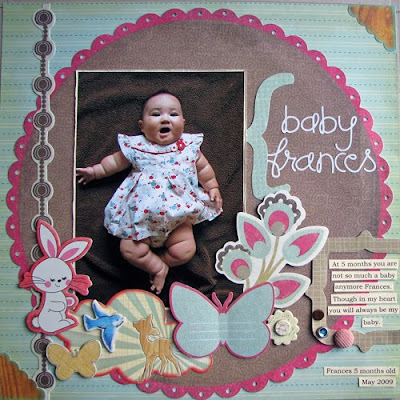 Not my best LO, but my first LO of Frances. It will always have a special place. Look at those baby rolls! Need I say more? My two favorite people so how can it not be in the top ten? I love these photos and love how this lo turned out. This is my second favorite LO of all time (the first being the first of this post). I just laugh every time I see it. And last- one of my more recent LO's. My little girly is one! 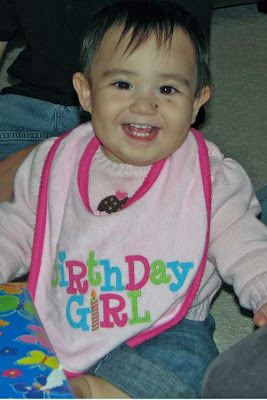 This is the birthday girl in her cutel little bday bib opening presents. Her party was the Sat. before Christmas. The birthday girl and mommy. The birthday party had a Curious George theme so we just had to have George cupcakes. 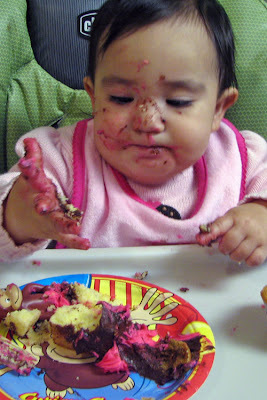 Frances enjoying her first ever piece of cake (or any type of sweet for that matter). I think she liked it. 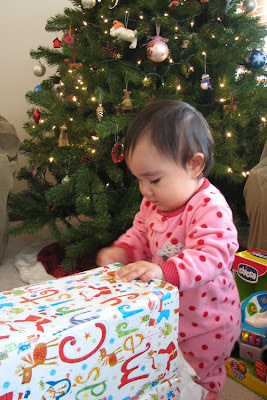 I think she had a lot of practice opening presents at her party. Here she looks like a pro. 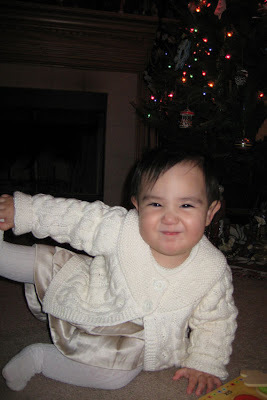 And her best pose in her Christmas outfit. I just love this one! I hope everyone had a great Christmas and has an even better New Year! A sneak peak at the SO January kit! 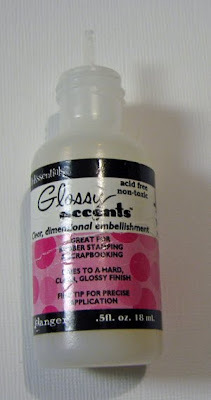 Heather at Simply Obsessed has decided to change things up. Which is good news for me because it means I get the monthy kit early! The kit reveals will now start the third week of the month BEFORE the kit is released instead of in conjunction with the kit release. That means you can see all the DT projects and be ready to scrap when your kit arrives. There are so many fun little things in this kit, I just don't know where to start. All the stars and metal - I had to hold back on using it all on one layout. The Making Memories foil die cuts (available as an add-on) are awesome too. I love all the fun boy sayings on them. 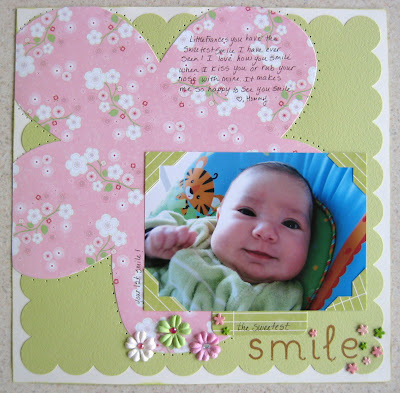 Having a girl I am usually creating pink girly pages so this was a welcome change. Before my daughter was born I mostly scrapped my nephews and doggies, but have fallen behind lately. This kit was the perfect reason to go back and scrap these older pictures. 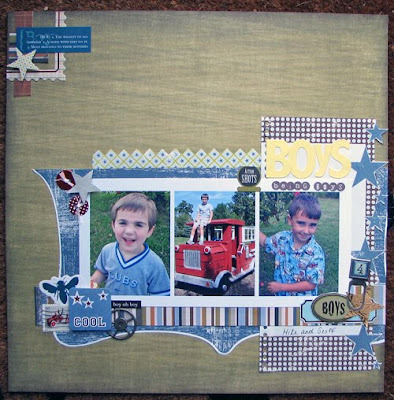 This layout is of my nephews at the park a few summers ago. As soon as I saw those cute stamps I knew I had to take these pics out. It is a little hard to see in the picture, but the tractor on the stamp looks just like the one my nephew is sitting on. 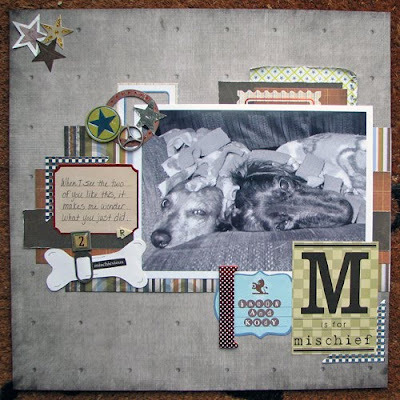 The second layout is of my doggies Bacon and Kody. They are always into some kind of mischief so I used the big sticker from the sticker sheet as my title. They are laying under a hot pink blanket so I chose to use a black and white photo. I used some white leftover cardstock to make a little dog bone and added the mischeivous sticker. The journaling says: "When I see the two of you like this, it makes me wonder what you just did." 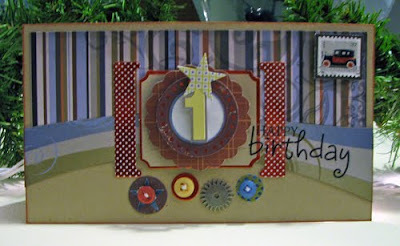 And last- I created this bday card for my friend's little boy who is turning one. She really isn't into the cutesy stuff so I thought she would like this "all boy" card. The picture is blurry because I had to take it at night. Sorry! 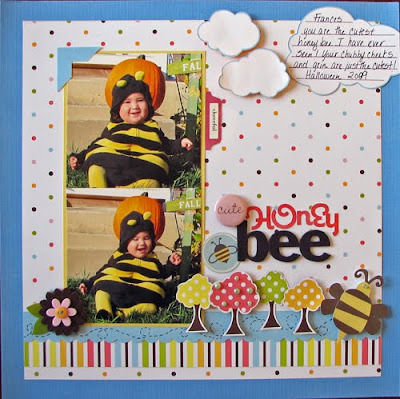 Hop on over to Simply Obsessed to get your hands on this kit! The January kit will start shipping the first week of January and you don't want to miss out. Thanks for stopping by and have a wonderful holiday. We will be celebrating both Christmas and a first birthday in our house! Yay! Only one more day until Christmas Break! This Christmas and birthday together is wearing me out. I have been so busy planning little Frances's part I haven't had time to buy any Christmas presents. Luckily I have Monday off work so I can spend all day shopping. I think I have everything planned for the little girlies big day except for the cake. 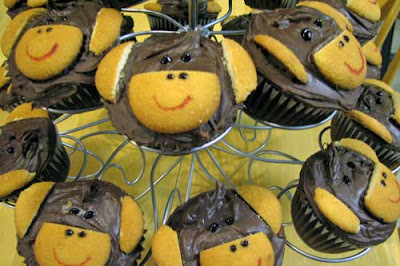 It is going to be a Curious George theme and I still need a curious george cake. George has been harder to find that I thought. Lots of Pooh cakes, but no George cakes. So I will be on the hunt tomorrow. 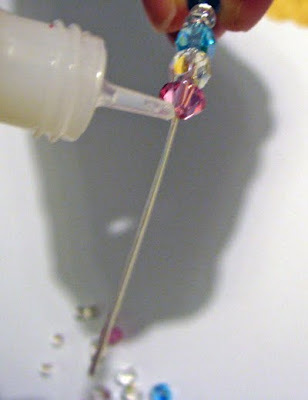 In my spare time (hahahaha) I put this tutorial together for Simply Obsessed. Please forgive me for the pictures. I was taking these last night at midnight. Did I mention the little girl had a fever of 104 yesterday so I had to take her to the immediate care? Oh and I hit my MIL's car backing out of the driveway in the process. So it was a pretty busy night. My husband did make some comments again about it this morning. Sheeesh, besides inventing a time machine and preventing the accident all togher there's really not much I can do about it now, but I will probably hear about this one for awhile. Well Poor little Frances is sick. All she wants to do is lay down and hug her curious george. It is pretty cute though. I came home from school today and took her temperature and it was 104. I was pretty worried so I put her in the car and rushed out the garage. Well in my rush I forgot my mother in laws car was parked in the driveway and backed into it. And it was hard. There is a huge big blue dent in the side. I felt like such an idiot. Who backs into a car that is in the drive way? Oh well I am just hoping she feels better for her curious George birthday party Saturday :). One good thing happened today though. I was asked to stay another month on the A Walk Down Memory Lane DT! Yay! I thought these would be my last projects, but I will have one more month and a few more projects besides my December projects below. Today is December 12th so the A Walk Dowm Memory Lane 12 days of Christmas crop is almost over. Don't worry, you still have until December 13th to take advantage of all the sales. 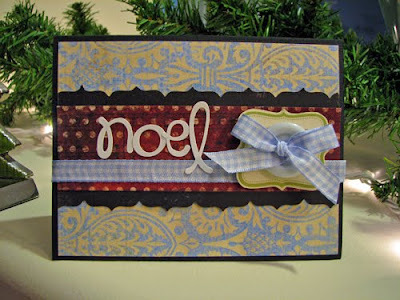 There were some great sales if you haven't checked it out- idea books, chipboard, border punches, just to name a few. You can also take part in the challenges for another few weeks. December 24th is the deadline to upload the challenge projects to the DT blog for your chance to win a prize pack from the store. Good Luck! It is a snowy winter wonderland here! It started snowing this morning and hasn't stopped since. And it is supposed to be 5 degrees tonight. It is going to be chilly! I hope you are staying warm and toasty in your neck of the woods. These two cards are perfect for this weather. 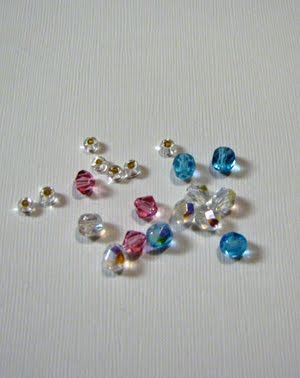 I created them for the 12 days of Christmas crop at A Walk Down Memory Lane. 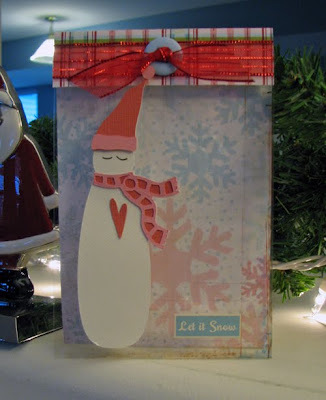 I used an old Pink Paislee overlay to make the top of my card and Basic Grey Eskimo Kisses paper for the back. And I couldn't resist cutting that cute snowwoman with my cricut again. I lover her scarf, it is so cute! Stay warm and have a great night. Look at this cute little bee! I finally found the perfect paper to use for Frances's halloween costume. I was going to use some of my halloween paper, but then thought this was so much cuter! 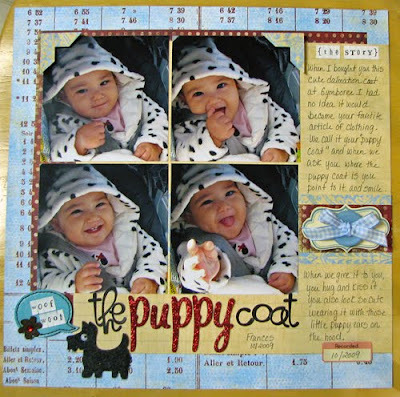 The paper and embellies are from the American Crafts everyday and hey there collections from the A Walk Down Memory Lane store (American Crafts is their featured manufaturer this month and all AC is 15%). I also used my cricut to cut that cute little bee and added some Kaiser pearls for his eyes. I can't believe how fast this little one is growing. This time last year I could not wait for her to be born. Now she is walking and talking and getting into all kinds of mischeif. Her new skill is shaking her head no. She doesn't know yes yet so any question you ask her she shakes her head and laughs. It is so cute. We ask her all kinds of questions- "do you want your nose wiped? ", "do you want to give mommy a hug", "do you love the doggies?" and she just laughs and shakes her head. Also there is a 12 days of Christmas crop going on over at Simply Obsessed. 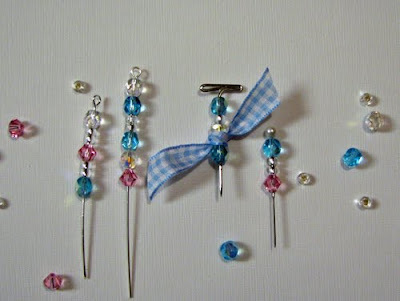 I posted these projects this weekend. 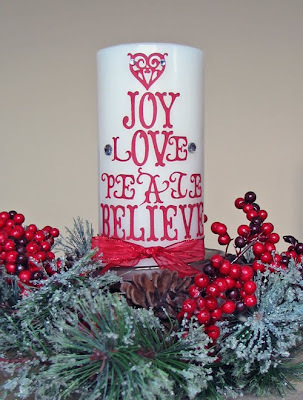 I created this candle by diecutting the words with the storybook cricut cartridge and then adhering them. Really easy and it looks great in my dining room. 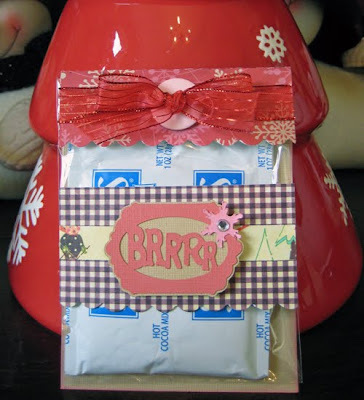 I then used my cricut winter woodland cartridge to create this hot cocoa card. I am glad I am getting some use out of my cricut. I bought 11 (yes 11) cartridges over thanksgiving weekend. 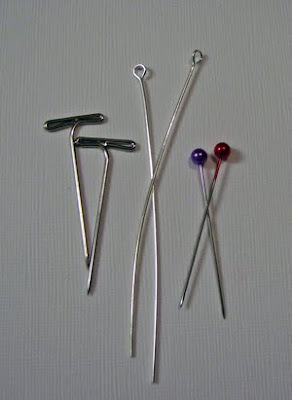 They were all sitting on my kitchen table and my husband asked me when provo craft was sending him his thank you card. So now whenever I use it I announce "I am using the cricut now". I also discovered Frances is terrified of the thing. She was sitting next to me when I was using it and when it turned on she crawled away as fast as she could. Now she gives it a funny look every time she sees it. She is just such a little cutie. Well have a great night. 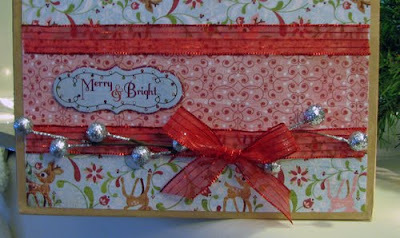 I will be back tomorrow with some Christmas cards for the A Walk Down Memory Lane christmas crop. Can you believe only 23 more days until Christmas? 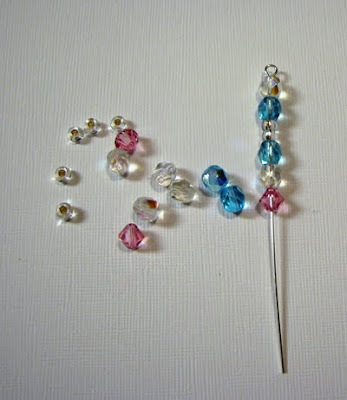 With all the Christmas projects popping up it is really putting me in the Christmas spirit. And it is supposed to snow today too! I don't know if I am ready for that just yet though. 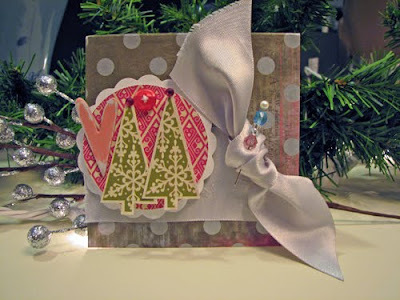 I created these three projects my December Simply Obsessed kit. Aren't the Christmas papers so fun? 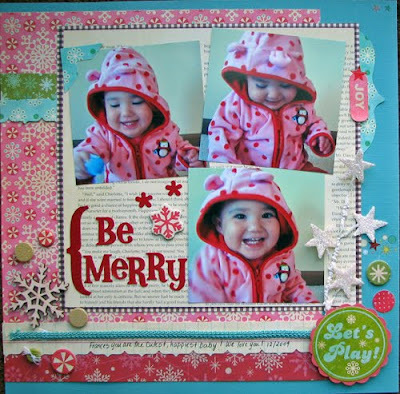 This first layout is of Frances playing while we were putting up the Christmas tree. She is seriously the happiest baby ever. She just amuses herself with her little toys. She may always be happy, but not always cooperative. I wanted to take some pictures of her in this cute Santa hat, but she kept taking it off. I think her face in the last pic says it all! 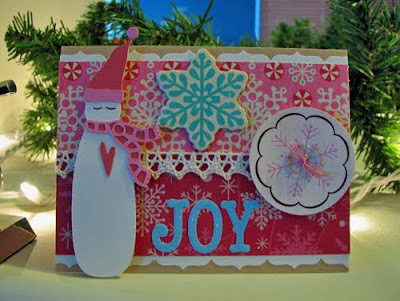 And I couldn't resist opening up my new Winter Wonderland cricut cartridge for this card. I cut the snowwoman and pieced her together. Isn't she cute? 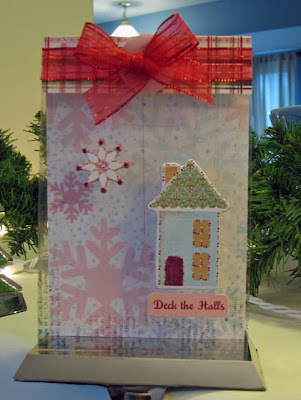 And A Walk Down Memory Lane is having a 12 days of Christmas crop on the DT Blog. There will be projects, challenges and sales each day. 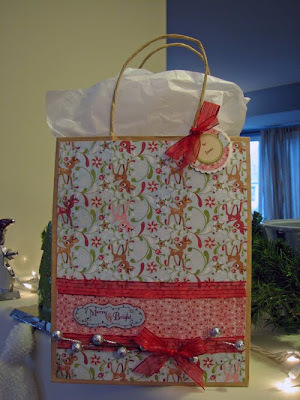 I created this gift bag with some old Christmas decorations and the super cute Basic Grey Eskimo Kisses paper and chipboard. You can see the full project on the DT blog here.